We are scientists and change-makers. The Clark Fork Watershed Education Program (CFWEP) seeks to inspire people of all ages to engage as scientifically literate citizens working for positive change. How can you be involved with CFWEP? The Clark Fork Watershed Education Program (CFWEP) serves communities across Montana and throughout the Clark Fork Watershed. We focus on place-based environmental education through student programs, teacher professional development, and public engagement and outreach. Environmental education meets watershed science. 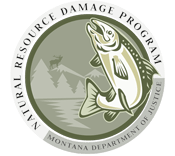 CFWEP is largely funded through the Montana Natural Resource Damage Program (NRDP).